This complex of megalithic monuments lies on the boundary between Oxfordshire and Warwickshire, on the edge of the Cotswold hills. They span nearly 2000 years of Neolithic and Bronze age development and each site dates from a different period. The oldest, the Whispering Knights dolmen, is early Neolithic, circa 3,800-3,500 BC, the King's Men stone circle is late Neolithic, circa 2,500 BC; and the King Stone is early to middle Bronze Age, circa 1,500 BC. The Stones are made of natural boulders of Jurassic oolitic limestone which forms the bulk of the Cotswold hills. This stone has been used extensively in the region for building everything from churches and houses to stone walls. The boulders used to construct the Rollright Stones were probably collected from within 500m of the site. The origin of the name ‘Rollright’ is somewhat uncertain. One interpretation is that it is derived from the Old English ‘Hrolla’+ ‘landriht’, the land-right or property of Hrolla. 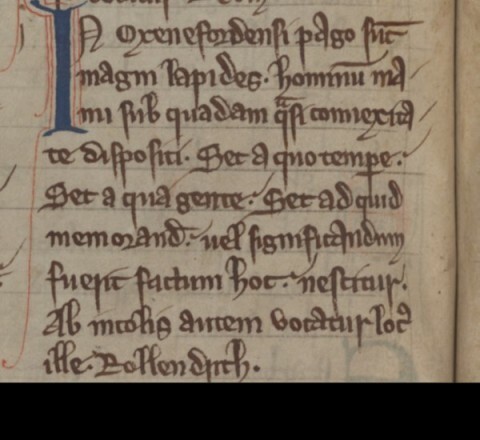 Old English is the earliest historical form of the English language brought to England by Anglo-Saxon settlers probably in the mid 5th century. Another theory is that it is derived from an even older Celtic language ‘rod’ + ‘land’ + ‘ricc’ meaning the ‘ricc’ (groove, gorge or steep valley) by the ‘rodland’ (wheel arena) – i.e. the stone circle. Excavation at Rollright showing artifacts unearthed. Before the first megalithic monuments were built at Rollright there had already been human activity on the ridge in the late Mesolithic period (c.6,500-4,000 BC). 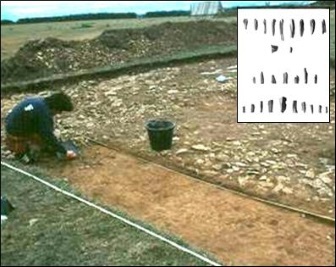 Excavation of the buried soil beneath a small barrow near the King Stone revealed a small, dense scatter of snapped flint bladelets and a broken arrowhead. There were no joins between the snapped blades, suggesting that they were discards, the other halves kept and taken away to make implements. They were found next to a tree-throw hole where a fallen tree may have created a small glade that was a convenient place to prepare the flints — a task that perhaps took only a few minutes. A few other Mesolithic flints have been found in the surrounding fields. The long mound that supposedly hid the view of Long Compton from the legendary King is not a long barrow but a natural knoll. Nonetheless, this prominent position was chosen as the site for a circular burial cairn. It was 17m across, built of stones heaped round a central burial chamber, of which the tip of the capstone is still just visible poking through the grass. The edge of the cairn was formed by neat dry-stone walling. The central chamber has never been investigated, but there were secondary cremations in the top of the cairn, and a cremated child’s tooth associated with charcoal radiocarbon dated to c.1925-1728 BC was found where the dry-stone walling had been burnt. Close to the King Stone another cremation dated to c.1735-1713 BC had been marked by an upright post. In the eighteenth century Stukeley identified a small barrow north-west of the King Stone. The mound had since been flattened by ploughing, leaving only a scatter of stones overlying a thin layer of original soil. 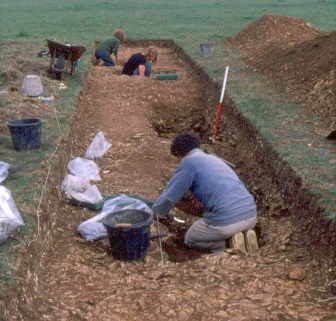 Excavation in the 1980s revealed various human cremation deposits, including an unusual ‘tunnel’ cremation radiocarbon dated to c.1880-1746 BC that had been marked by a large, roughly rectangular post. At around either 1731-1719 or 1692-1500 BC (the date being especially uncertain because of a hiatus in the C14 calibration curve), the cremated remains of a child were buried with an upturned collared urn in a small pit close to the foot of the post. The ‘tunnel’ cremation consisted of a mixture of cremated bone and charcoal placed in a small cave-like hole hollowed out of the side of a rock-cut pit. A small blocking stone had been placed vertically across the entrance of the hole and the large post was then placed in the pit. The remainder of the cremated bone and charcoal was scattered round the base of the post before its pit was filled in with well-packed soil and stones to hold the post upright. A trackway and single ditch in the field between the Whispering Knights and the King's Men are visible as crop marks on air photographs. Pottery from small-scale excavations suggest that the ditches are part of a late Bronze Age or early Iron Age field system c.1000-500BC. The trackway was heading towards a ditched enclosure also known from air photography and geophysical survey. Small-scale excavation showed that the enclosure was occupied in the middle Iron Age (c.400-100BC) though the settlement might have had earlier origins. The enclosure ditch was rock-cut, almost 2m deep and would have produced enough stone to build a protective wall. Just inside the western side of the enclosure a shallow curving gully may have surrounded a house; and outside it rock-cut pits were probably used for grain storage. 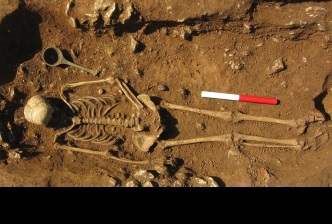 Animal bones and carbonised crop and weed remains indicated a typical mixed farm growing spelt wheat and rearing sheep, cattle and a few pigs. In the Roman period a new agricultural settlement was established west of the King Stone; a thin scatter of pottery shows that manure and domestic refuse were thrown on the surrounding fields. 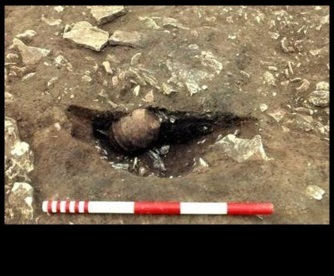 Pottery finds also suggest that the King's Men were visited in the Roman period. Prehistoric monuments were often recognised as special places by pagan Saxon communities who settled in Britain after the Roman period. Rollright was no exception. In the mid 19th century stone quarrying near the Stones revealed typical grave goods of an early Saxon cemetery, c. 700 AD, including a cremation urn, beads and a bracelet. In 2015 further finds were made. Excavation revealed the burial of a young woman in her twenties (see left) with some exceptional grave goods, including a long-handled bronze pan and traces of a wooden box with silver mounts. She is likely to have been an important person in the community. The cemetery is at the junction of what later became three parishes, typically reflecting the importance of such boundary locations — especially in the vicinity of ancient sites. It is likely that the Stones themselves were once again an important meeting place. 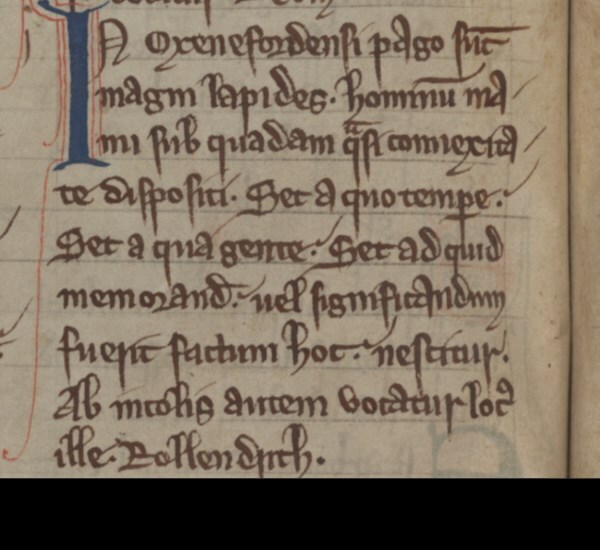 Little Rollright, the parish in which the Stones are located, is first mentioned in the Domesday Book (AD 1086) when it was valued at £5 and was held by Columba the Monk under the tenancy-in-chief of the Bishop of Lincoln. At that time there were 12 villagers, 3 smallholders and 2 slaves. There was land for 6 ploughs and 25 acres of meadow. The Rollright Stones themselves are first referred to in a late 12th century account of the Wonders of Britain, which says “In the region of Oxfordshire there are great stones disposed as if by the hand of man. But at what time, or by what people, or for what memorial or significance this was done is not known. However that place is called Rollendrich by the local people." Later in the middle ages Little Rollright became one of the farming estates of Eynsham Abbey, which relied on it for income. In common with many Cotswold landowners in the late 15th century, the Abbey saw sheep farming as the way to make money. In the decade 1496 to 1505 400 acres of arable were enclosed and converted to pasture with the loss of five village landholdings and the eviction of 36 people. In effect the village was all but deserted and it never recovered as a settlement. 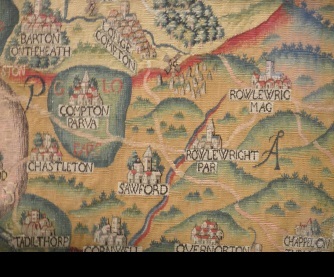 The boom in the wool trade did not last, and by the 17th century (the date of the first detailed map of the estate) a balance had been restored between arable on the well-drained hillside, pasture on the lower slopes below the spring-line and meadow on the valley floor. 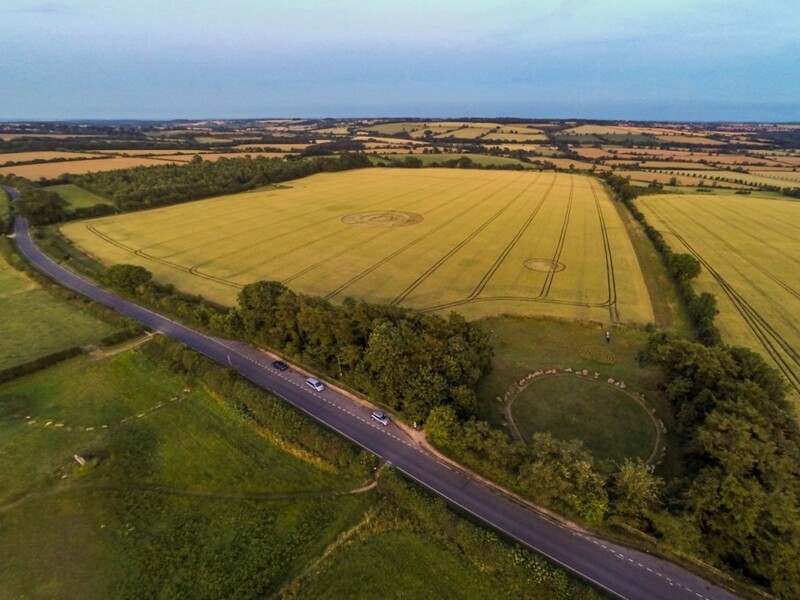 The very big fields created by Eynsham Abbey were subdivided in the 18th and 19th century, and the open common land of Long Compton on the other side of the road was enclosed for the first time. Together these changes created the structure of the fields and hedges that we see today, only the Stones themselves remaining unchanged. In the mid 19th century a group of larches was planted within the King's Men stone circle which lasted till the second world war. They were replaced by the two copses either side of the stone circle that survive today. The prominent location of the Stones on the crest of the Cotswolds means that the site is a good vantage point to see in all directions. During the Second World War a Royal Signals Corps post was sited on the natural rise by the King Stone to watch for enemy aircraft. In order to obtain a clear 360 degree view the ring of very large larches in the Stone circle was felled. During the Cold War the post was still relevant to Britain’s defences, and what had been a simple hut with a telephone connection became an early warning post with a subterranean chamber. The bunker was decommissioned and capped off in 1992. All surface remains were removed but remains of the concrete access shaft are visible nearby.